Here in Los Angeles, Burmese food is a rarity. You can drive throughout the streets of LA and you probably won't find one for miles on end. I've been to Burma Superstar in San Francisco and it was absolutely amazing. So when I heard there was a Burmese restaurant that opened in Silverlake, I knew I had to jump on the chance to try it. Daw Yee Myanmar Corner is the second restaurant from the Daw Yee Myanmar Café located in Monterey Park, CA. Dellun Chow is a second generation Burmese who has managed to incorporate Burmese authenticity with hipster Silverlake. 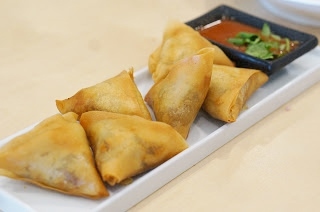 Classic Burmese dishes like the tea leaf salad and samosas are integrated into the menu. 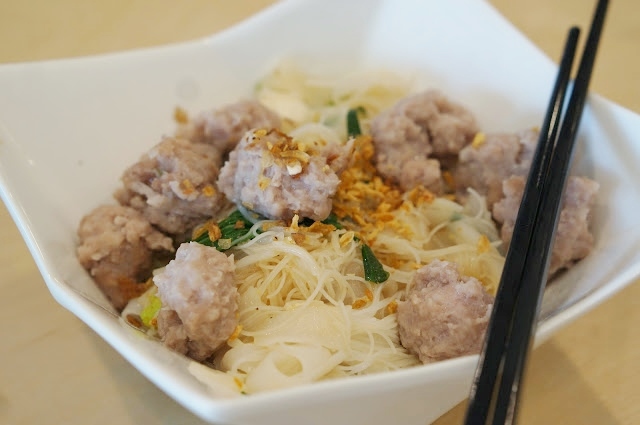 KYAE OH NOODLE SOUP (DRY VERSION TOSS IN GARLIC OIL) ($9.95): Rice Vermicelli, Flat Rice Noodles, Ground Pork, Tofu, Quail Egg, Fish Ball, Mustard Greens and Chives (GF). This dish reminds me of some home cooking. My mom would make something similar to this. It has a lot of what seems to be Southeast Asian flavors mixed with Chinese. It's filling and could definitely be shared. 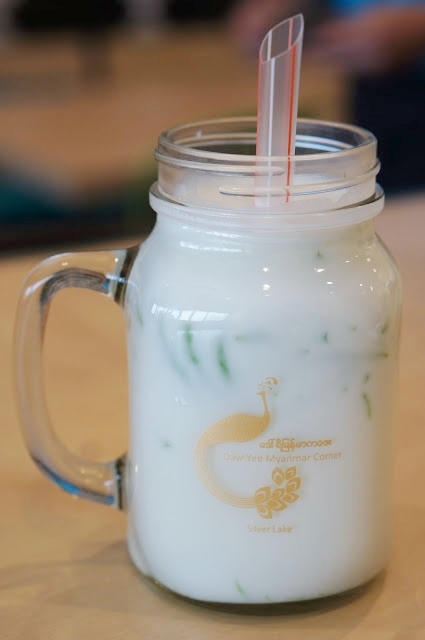 MOLASONG DRINK ($4.00): Pandan Jelly, Tapioca, Coconut Milk, Whole Milk. This tastes like one of those drinks you get at a Vietnamese café. It's a bit on the sweeter end and the coconut milk flavor definitely comes through. It almost feels like a dessert rather than a drink. It's good nonetheless. 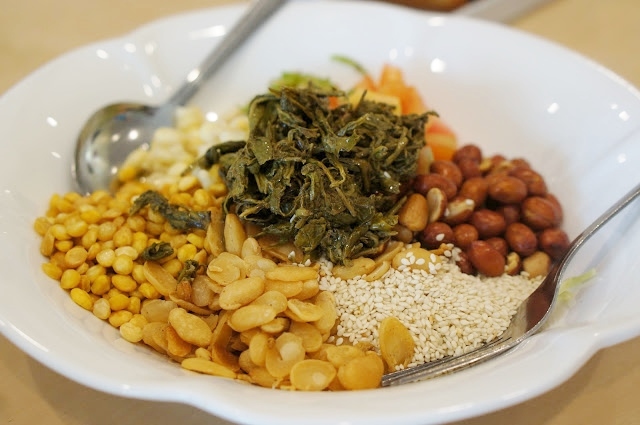 TEA LEAF SALAD ($9.95): Myanmar Imported Fermented Tea Leaves, Tomatoes, Roasted Peanuts, Fried Yellow Lentils, Fried Garlic, Toasted Sesame, Diced Tomatoes, Steamed Corn and Shredded Cabbage (Vegan, GF). This tea leaf salad is a bit different than the one at Burma Superstar. It has a lot of texture from the Peanuts and Yellow Lentils but I felt like its missing something. Maybe more fish sauce? It fell a little short for me, but it's still worth a try! SAMOSAS (6 PIECES-$7.95): Fried Pastry Filled With Potatoes and Onions Seasoned with Masala Curry Spices (Vegan). I thought the samosas were really good. A hint of Indian flavors with a bit of Asian, how could you go wrong? They were super crispy just the way I like them and the interior was soft. Cooked perfectly. The sauce that comes with it is pretty amazing too. MY FAVORITE DISH. 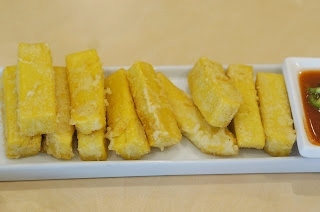 FRIED MYANMAR TOFU (12 PIECES - $7.95): Homemade Yellow Lentil Tofu (Soy Free) with a Hint of Tumeric Fried in Light Batter (Vegan). I love these little suckers. They're super addicting. It's not your typical tofu that you normally eat. It's made out of yellow lentils and the texture is out of this world. Crispy on the outside with a cornemal-like texture. Not at all greasy! Its a must order! I wish I could eat these at home while I'm watching Game of Thrones on the couch! Overall, Daw Yee Myanmar Corner is a nice addition to Silverlake. The food definitely meshes well with the hipster town and there are tons of vegan options! 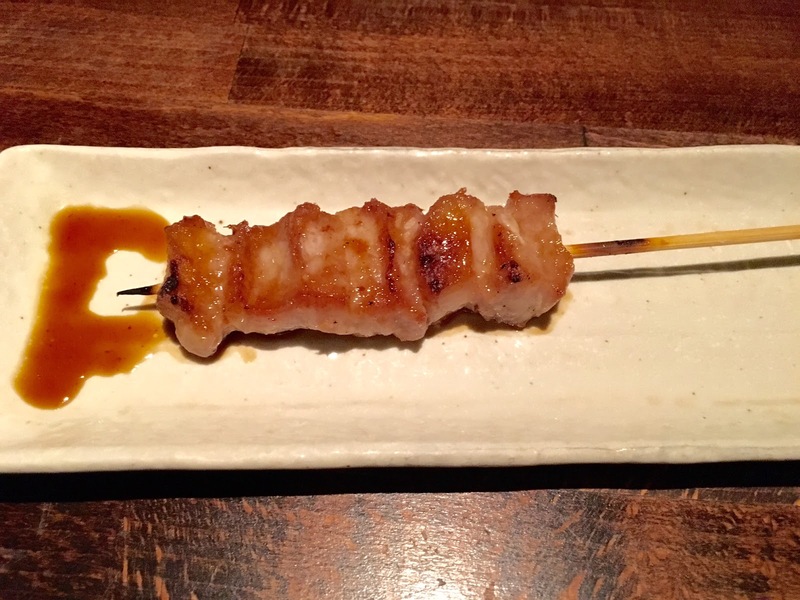 It's casual and I appreciate the simple food with bold flavors. It's definitely worth a try if you've never had Burmese food cause once you taste those fried tofu sticks, you'll be hooked! On a side note, you'll receive 10% off during the soft opening but you may want to call and see how long it'll be going on for. Homemade pie is comfort food at its best. Located in a cool little spot in the Arts District of Los Angeles sits a hole in the wall pie shop known as the Pie Hole. It is a family run restaurant serving both savory and sweet pies as well as Fair Trade organic coffee. Becky Grasley and Matthew Heffner, the mother and son duo who started this place, has since expanded to other locations in the OC and LA. The shop itself is very quaint, with outdoor seating and a large communal table indoors. Recipes are framed and hung as artwork for the pie shop. CEREAL KILLER CHEESECAKE ($6.25): It's your breakfast dream come true. A sweet and delicious cheesecake filled with fruity pebbles and topped with cornflakes. Crunchy and creamy all rolled up into one. Need I say more? MY FAVORITE DISH. EARL GREY TEA PIE ($6.75): I can't reiterate how delicious this pie is. The crust is flaky and not overly dense. The filling is nice and smooth. The hint of earl grey just slightly coats the palate without it overpowering the whole pie. Hints of chocolate can be tasted as well. It's one of the those pies that is one of a kind. Overall, this pie shop is great! The vibe is slightly hipster and the pies are unique. I appreciate that they offer both sweet and savory so you're not contingent on one type of taste. It's a great place to catch up with friends over coffee and some delicious pie. The location is kinda hidden but just look for the Wurstkuche and you know you're nearby. I absolutely love noodles and pasta, especially slightly thicker ones. When I heard there was a place in Little Tokyo in Downtown Los Angeles that makes homemade udon noodles, I knew I had to pay a visit. The queue to have these scrumptious noodles is usually pretty ridiculous. People tend to swap between Daikokuya next door and Marugame Monzo, whichever noodle shop would take them first. I've been for both lunch and dinner and the lunch rush isn't as bad as the dinner rush. The menu is pretty much the same, but the lunch menu lacks one of my favorite appetizers: the beef tataki. The restaurant isn't anything fancy. It's actually simple in fact. When you arrive, you put your name down on a clipboard and wait patiently to be called to be seated. If you look directly to the end of the restaurant, a clear window is seen where you can witness the chefs making the udon by hand. NEGITORO BOWL (UDON COMBO + $4.00): Fatty Tuna Chopped with Green Onions Over Rice. Sweet Sauce with Mayo. At first glance, I was kinda turned off with all the mayo that was on the dish, but once you mixed everything together, the dish came together nicely. It was like a spicy tuna roll deconstructed, but tasted way better. KAMAAGE UDON ($7.95): Hot Udon from "Kama" boll pot, hot broth dipping style. I thoroughly enjoyed my udon. I loved the dipping broth that came with it. It's very similar to a dipping sauce for soba. It wasn't overly salty and was seasoned nicely. The dish comes with ginger, tempura flakes, green onion and radish for you to season your broth to your liking. I finished it like a pro and probably could've ate another! MY FAVORITE DISH. SEA URCHIN CREAM UDON ($15.95): Hand Crushed Sea Urchin Cream Sauce Udon, Topped with Ikura (salmon egg). This dish is rich and delicious. The uni isn't overwhelming, just having notes of uni coating your palate with each bite. The cream sauce is not too thick and coats the fresh udon well. The ikura adds a nice salty flavor to the dish. It's definitely not a diet dish by any means. Who cares though? It's yummy, creamy and oh so tasty! Overall, Marugame Monzo is a great alternative to the very popular ramen. There are many options where you can order something light with a clear broth or something more satisfying with a cream sauce. The wait times can be annoying but I seriously believe it's worth the wait. Lunch and dinner menus vary slightly, but you can still get the same udon noodles at both hours. On a side note: they only open for lunch from 11:30am-2:30pm. 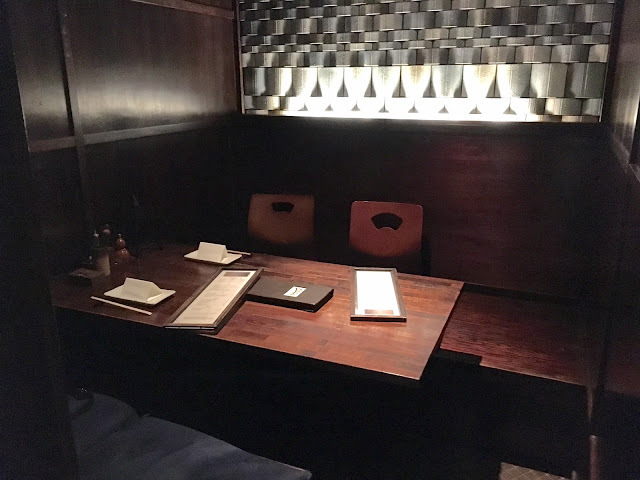 Raku is a Japanese charcoal grill restaurant owned by Mitsuo Endo, a Tokyo born chef trained in kaiseki cuisine. The restaurant uses charcoal imported from Japan. Endo has been awarded as a semifinalist for the James Beard Award Chef Southwest. When you step foot into Raku, the aroma of the food being grilled is alluring. Raku's charcoal burns at a higher temperature than most other charcoals, creating a crispy finish while bringing out the flavor of the ingredients. The seating is quite comfortable. There is a bar where you can eat, watching the chefs cook as well as secluded tables where you can have some privacy. The women's bathroom is worth checking out: there is an aquarium taking up half of the wall! YELLOWTAIL CARPACCIO ($12.00): This was so good. 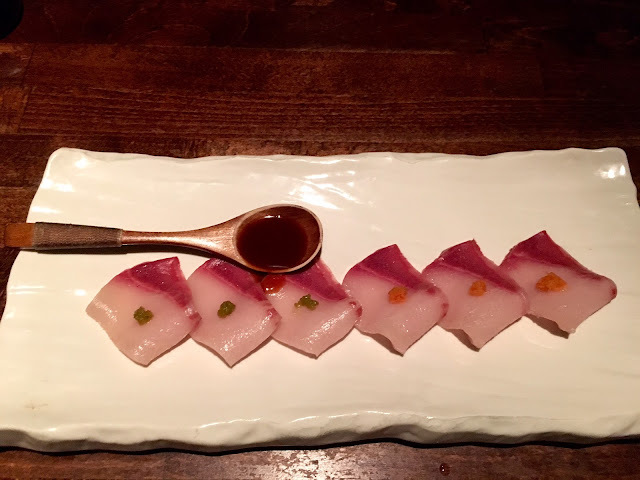 The yellowtail was fresh and melt in your mouth good and the sauce that came with it was slightly smoky with a hint of spiciness. It's a good, light starter to begin your meal. 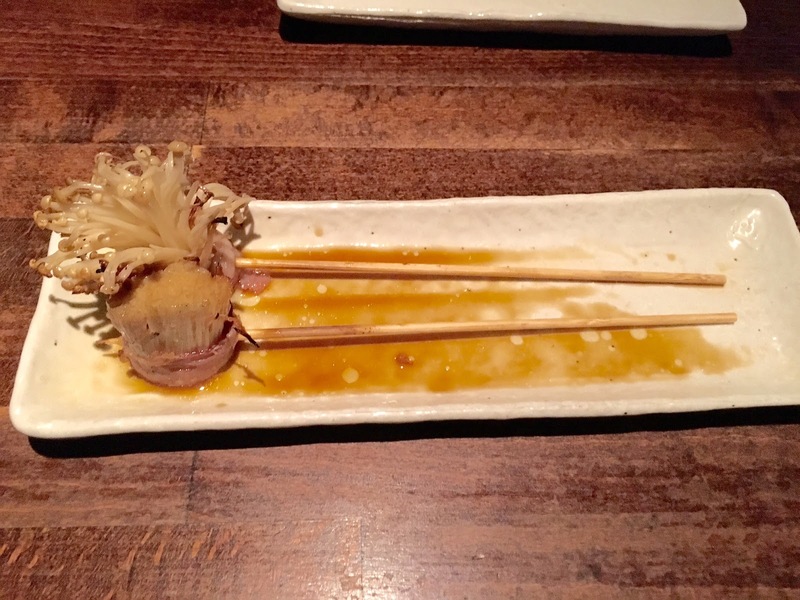 ENOKI MUSHROOM WRAPPED WITH BACON ($3.00): The mushrooms were cooked nicely and the bacon added a nice saltiness to the dish. It was a nice bite with a great crisp texture from the mushroom. I thoroughly enjoyed this dish. 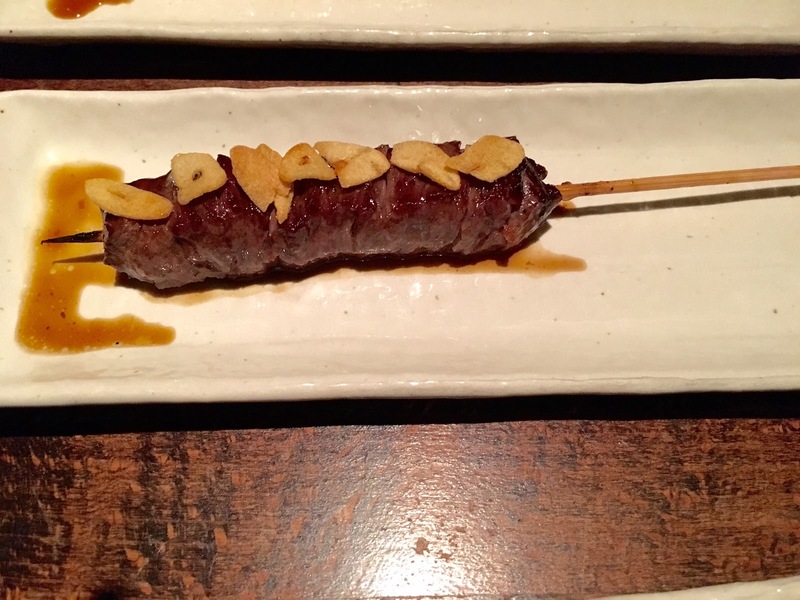 KOBE BEEF OUTSIDE SKIRT WITH GARLIC ($7.50): The beef was cooked well to a nice medium. It was juicy and the marinade was delicious. The garlic chips on top of the beef added another level of flavor while giving it a crunch. A good dish overall. MY FAVORITE DISH. 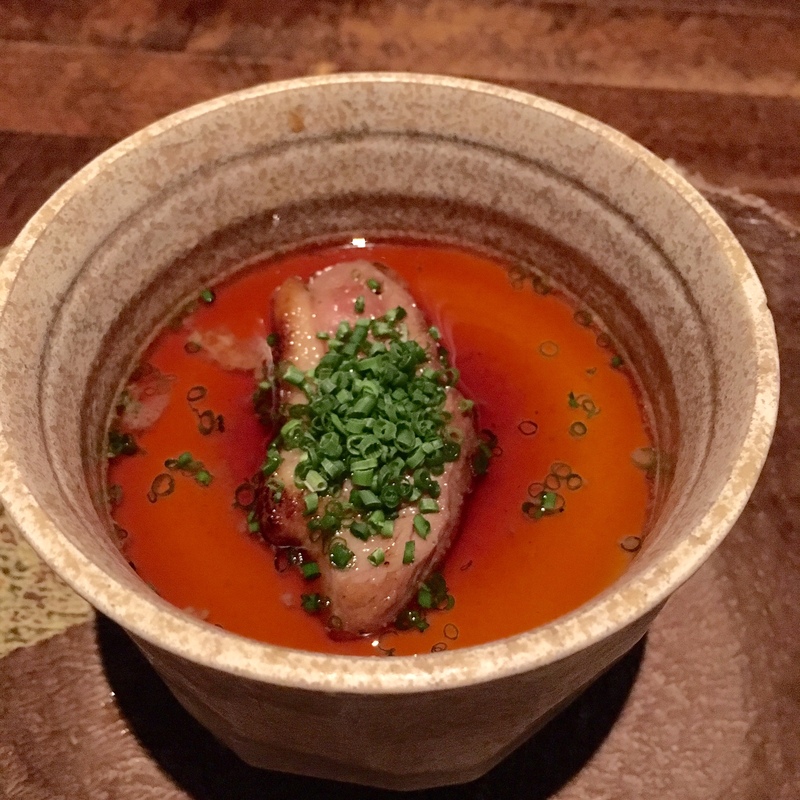 STEAMED FOIE GRAS EGG CUSTARD ($10.00): I absolutely loved this dish. 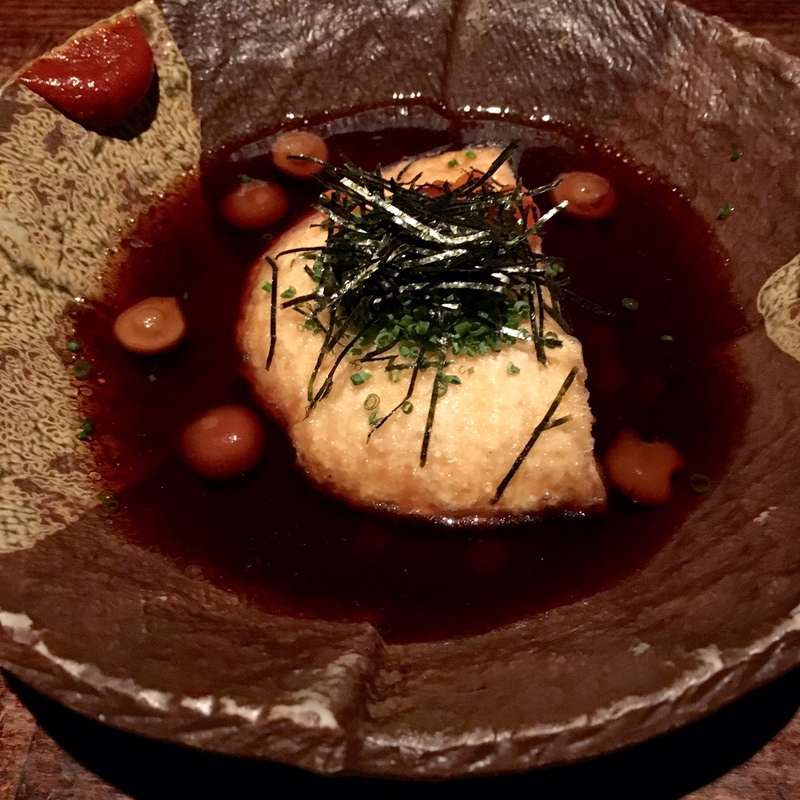 My friend who resides in Tokyo was amazed at the flavor of this dish. She was a bit taken back from the lack of ingredients from the usual steamed egg custard she's had in Tokyo. Regardless, we both agreed it was yummy. The foie gras was not overpowering and the custard was deliciously smooth. A must order! AGEDASHI TOFU (HALF-$7.50): The tofu at Raku is made in house and was delicious. The exterior of the tofu had a nice crunch while the tofu remained delicately soft. It was topped with salmon roe, which I could've done without.The broth complemented the tofu well. COLD GREEN TEA SOBA WITH POACHED EGG ($8.50): This dish was nothing special. 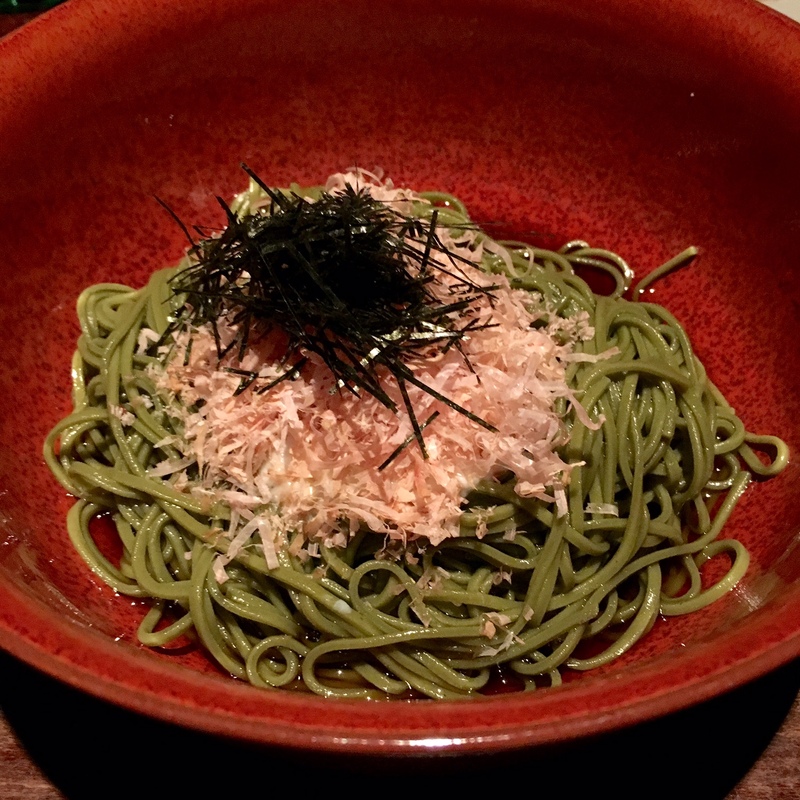 The soba noodles tasted like any other soba noodles. I really couldn't taste the green tea that I was hoping. The poached egg was lovely but still, this dish wasn't spectacular. 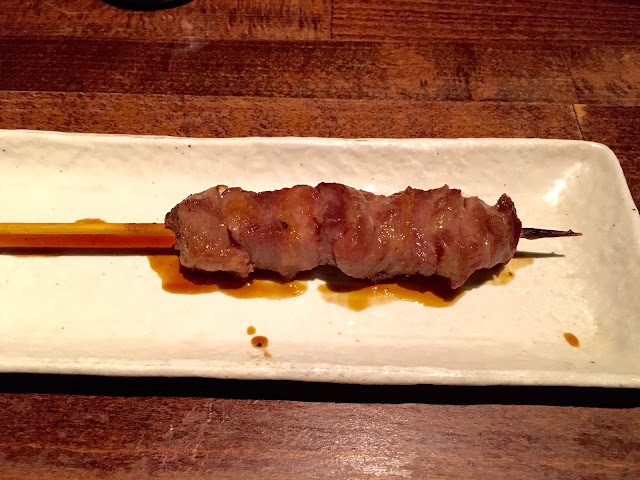 KUROBUTA PORK CHEEK ($4.25): This was one of my favorites and a must order. The pork cheek had so much flavor and was so nice and tender. It's kurobuta! How can you go wrong? IBERICO KUSHI (SPECIAL): This is also one of my favorites and probably my favorite out of all the grilled meats. The meat was tender and the sauce didn't overpower the taste of the meat. Overall, Raku was delicious. The service could've used a bit of work. We received one dish and waited about 30 minutes in between dishes until we said something about the food taking forever to be delivered to our table. It's truly authentic and my friend was able to speak Japanese to the staff. If you're in Vegas and want something a bit different than the usual Las Vegas Strip food, this is a good spot.